The crews of 617 Squadron that took part in the epic Dambusters raid on the night of 16/17 May 1943 were among the finest in the RAF. They were the elite of Bomber Command, and when they left RAF Scampton that night, the skills of their pilots – some of the finest of the Second World War, would be tested to the limit. In this outstanding new work Flight Lieutenant ‘Mick’ Martin, in company with Flight Lieutenant John Hopgood in the distance, follows one of the many canals of Holland, wingtips barely missing the sails of the windmills, en-route to the Möhne Dam. Delicately crafted in a subtle, unique blend of pencil and paint, Robert's latest masterpiece is a truly stunning and highly individual rendition of this most famous mission. Printed on the latest precision press, each of these exclusive limited edition prints is a true and faithful reproduction of his masterful original. 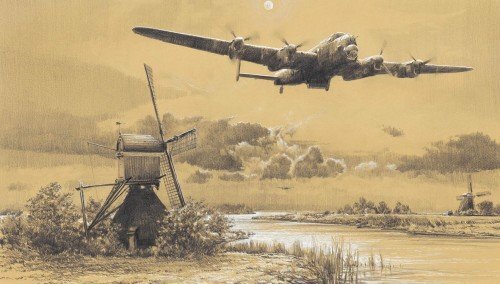 Every print in this breathtakingly beautiful new limited edition has been individually signed by the five surviving air crew veterans and a ground crew veteran of the Dams raid. Flight Engineer in Lancaster AJ-N – they breached the Eder Dam. Bomb Aimer on Lancaster AJ-T – they attacked the Sorpe Dam. Ground crew technician who worked on the Dambuster Lancasters. Rear Gunner in Lancaster AJ-F – they attacked the Sorpe Dam. commanders, assigned to attack the Sorpe Dam. Front Gunner in Lancaster AJ-N – they breached the Eder Dam.